Gretchen Ann Stude was born November 9, 1938 in St Paul, Minnesota. She was the eldest child of Herb and DeLoris Stude. 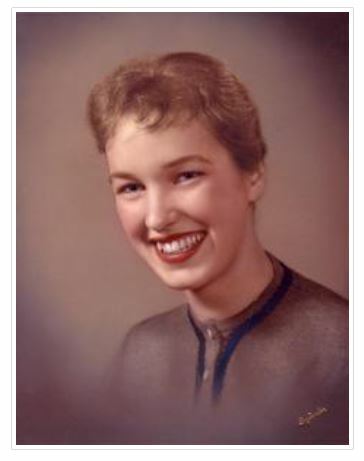 She was baptized at Redeemer Lutheran Church in St Paul on November 24, 1938. She later became big sister to six siblings. The family moved to the Northwest in 1945, spending time in Spokane, and then in Oregon City, Gladstone, and Mulino. Gretchen graduated from Molalla Union High School in 1956, as valedictorian of her class. She attended Concordia College in Portland, and Concordia College in River Forest, Illinois, and received a teaching certificate. She taught for one year in Niagara Falls, NY, and then returned to Portland to teach at Trinity Lutheran School from 1959-1962. In 1961, Gretchen married Bruce Kuhnau. They had two daughters, Charlotte and Kristine. Gretchen was diagnosed with Multiple Sclerosis in 1963. In spite of this diagnosis, her faith remained strong, and she faced life's challenges with a positive attitude and a smile. Gretchen is survived by her daughters Charlotte St. Clair (Jim), and Kristine Bartley (Dan); seven grandchildren; seven great-grandchildren; former husband, Bruce Kuhnau; brothers Herb Jr., Philip, Wendell, David and Mark; sister, Dorothy Cottingham; and numerous nieces and nephews. A memorial service for Gretchen will be held at 3 p.m. Saturday, Feb. 14, 2015, at Trinity Lutheran Church, 5520 N.E. Killingsworth St. Portland, Oregon.